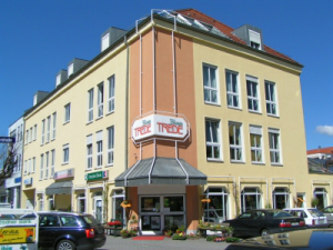 My modern equiped dental office is located in Furtmayrstrasse 5, in building of Blumenhaus Trede (second floor). It is located at the southern edge of downtown of Regensburg, near the Railway Station and Regensburg Arkaden, not far from Universität and Hochschule Regensburg. All Rooms are designed handicapped accessible, an elevator is available. There are three parking lots in the inner courtyardimmediatly before the gate of the Ibis Hotels. These are exclusively reservated for our patients during there treatment at our dental office. The bus stop (Line 3, 6, 10, 11, 19, 20, 21) Galgenbergbrücke is 200 Meter away. The main railway station of Regensburg is 600 Meter away.